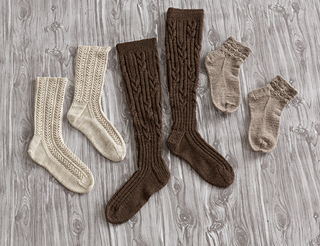 These pretty and feminine socks feature an easy to memorize lace rib pattern from top of cuff to toe shaping. making longer socks, plan to purchase additional yarn. Set of 4 double pointed needles (dpn) in size US 1 (2.25 mm) or size to obtain gauge. 31 sts and 40 rnds = 4” in Lace and Cable patts; 36 sts and 40 rnds = 4” in St st. Take time to save time, check your gauge.